It’s Fall, it’s October and it’s time for the third annual Fall Photo a Day! That’s how I feel. The leaves change, the weather cools off ( eventually), it’s boot and thick sweater season, the scenery is beautiful and pumpkins are everywhere. Simple: Just check the list every day and take a photo using the prompt as your inspiration. Use whatever camera you have available! I’ll be using a combo of my iPhone, my Canon 6D and My Canon M50. Then, share your photo on Instagram using the hashtag #everydayphotoaday. Go through the #Everydayphotoaday hashtag to like and comment and be a part of the community. Every Friday in October, I will go through and share four photos from the hashtag that have captured my attention in my Instagram Stories. If you need an easy way to remember the prompts, CLICK here or the photo above to download it to your computer or your phone. OR just take a screenshot and save it! Warm Cup of..: There are wonderful fall drinks out there. Which one are you drinking? Guilty Pleasure: Something that you love to do..even when you are not supposed to. Yellow: One of the colors of fall. Show us something yellow. Candy: It’s almost Halloween, what candy do you have? Saturday: What does your Saturday look like? The Front Door: What does your Fall Decor on your door look like? 8’oclock: What’s happening at 8 am or 8 pm? Fall Favorites: What are your favorite things about fall? Friyay: What’s going on this Friday? Pumpkins: Show us your pumpkins! Lazy Day Attire: what are you wearing? Every Morning: What’s your Monday routine? In My Bag: What’s in your bag? The view from here: what do you see? Family: who is your family? Where I stand: Where are you? New: show us something new to you! Something Orange: Another fall color! 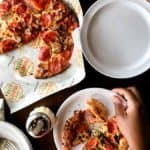 On the Table: what’s on your table? Right now? 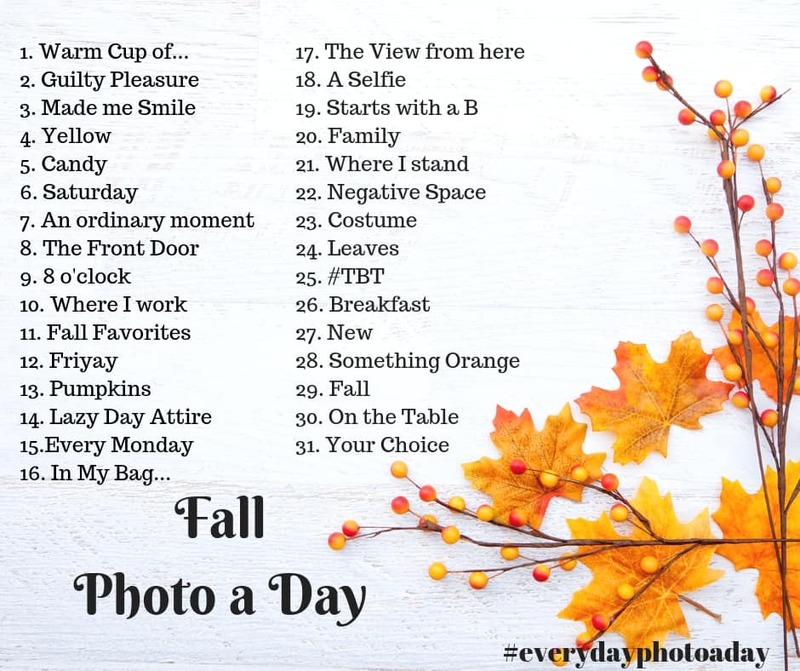 Can’t wait to see your photos for this fall photo a day challenge this October! Remember to tag your photos #everydayphotoaday! Join the Everyday Project and get this Limited time FREE Ebook to help you get started taking your best photos this year and access to resources, tools and tips to help you with your photography projects this year. April Photo a Day Challenge! Everyday Summer 100: The first 10 days….